Ammeraal Beltech provides belting solutions that match the Meat and Poultry Industry’s needs, such as hygienic design and Food Safety, durable and efficient processing and ease of cleaning. For all the process steps right up to end of line packaging, our belts help you maintain the highest levels of Food Safety without sacrificing efficiency or production time. This infographic is used as a general indicative example only. 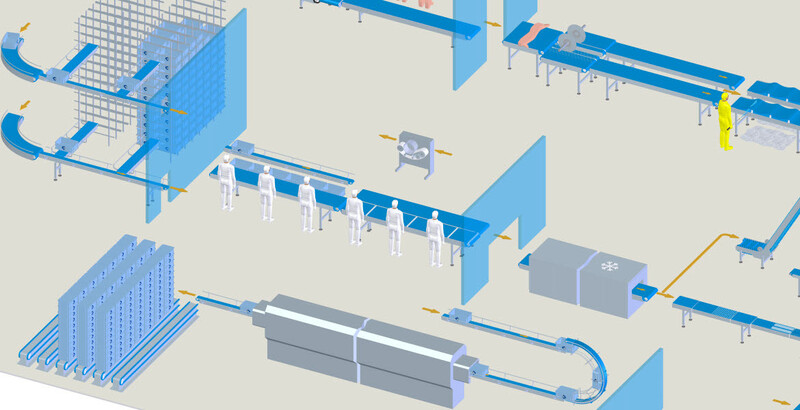 Actual factory and process configurations could vary, but our industry experts know them all. Stunning with CO2 followed by sticking is regarded as the most gentle method of slaughter. The concentration of CO2 in the air renders the animals unconscious. Then they are either electrically stunned or stunned with carbon dioxide (CO2). After cleaning, the animal comes to the clean slaughter line, where the organs are removed. The carcass is processed into main and by-products in several steps. The deboning speed is determined by the supply of carcasses or carcass parts. This keeps the pressure on the work-load and therefore on the production. The deboned meat and the by-products are checked in crates or on a conveyor belt and led away. Depending on the product, meat undergoes different processing, such as pickling, cooking, smoking, grilling, baking, maturing and drying. Cutting, slicing, meat separation and sausage stuffing are all processes where belts are needed. Full meat crates can weigh up to 150 lbs. A heavy duty belt is required to convey these heavy packages to the storage or dispatch area and often accumulation can occur. Packaging processes vary a lot depending on the type of meat being packaged. Packaging plays a key role in preservation and expected shelf life. Please fill in the following information. This form will be sent to info-us@ammeraalbeltech.com. *Recommended Products are some examples of our solutions in a specific process. Consult your local Ammeraal Beltech expert to determine the most appropriate belt type, color and material combination for your specific requirements and local stock availability.